With an ambitious plan of visiting all three tidewater glaciers in Aialik (eye-al-ick) fjord during the daylight hours of the second day of our training expedition, the crew was up early to start coffee and a scrumptious breakfast of hashers, zucchini, onions, scrambled eggs, and reindeer sausage in order to expedite an early departure from the Holgate arm. Due to a conflict with another sea kayaking group over campsite selection for the evening we decided to maintain a base camp in the Holgate arm, rather than moving camp to the Pedersen Lagoon as previously outlined in our float plan. Not only did this decision lighten our boats, and give our tents a chance to dry out from the overnight rain, but provided both paddling parties with the more remote wilderness vibe we all travel to Aialik fjord for, whilst only adding an additional 6 miles to our day trip from basecamp. Guides Andrew and Kelly (K2) paddling through the sea arch at Holgate Head at the end of the day. Paddling around Holgate Head into the slightly more exposed waters of the body of Aialik bay we scouted a sea arch that was impassable at the current low tide and spied two mountain goats lazily perched precariously on a cliff side just 50 feet above us. Two hours of paddling later after numerous marbled murrelet, pelagic cormorant, pigeon guillemot, and even a solitary white fronted goose sighting we landed just west of Slate Island on the mainland for a smoked salmon spread flatbread lunch with pickled onions, bell peppers, and capers. Smoked Salmon pizza spread yum!! After lunch we pushed off and were immediately cutting a path through reasonably thick brash ice with interspersed growlers and small icebergs on our way to view the enormous face of Aialik glacier, with our eyes out for hauled out harbor seals using the ice to warm up their bodies from the cold-sapping water. Strangely we saw no harbor seals in the vicinity although the bergs of Aialik glacier is a commonly known pupping area this time of year. The mile long terminal face of Aialik glacier had noticeably retreated since I'd last visited in late August of last year, and was beginning to show even more rock underneath the massive tongue, which perpetuated the hypothesis that it wouldn't be long before Aialik glacier will likely become a land-locked valley glacier, relinquished from its tidewater status. After marveling at the dynamic terminal face of ice for as long as we could without inhibiting our late afternoon plans, we reversed directions and cut ice back to the entrance of the tidally dependent and spectacular Pedersen Lagoon to view Pedersen Glacier. The dynamic Pedersen Lake, Lagoon, and Glacier system uniquely exemplifies a dynamic mix of geology/hydrology in action, biologic richness/diversity, and the boundary of where modern society (i.e. Kenai Fjords National Park) meets native ancestral lands of the Alutiiq Unegkurmiut (modern day Port Graham Authority), all overlain with a natural tone of epic grandeur. Entering the lagoon via sea kayak encourages a stark feeling of contrast between the ocean environment of Aialik bay and the sheltered lake-like feel of Pedersen Lagoon, which is a natural haven for harbor seals, and sea otters due to its protection from open ocean elements such as wind, wave action and predators. After floating the tidal current up into Pedersen Lake past a number of intimidating grounded icebergs we were astonished to be looking directly at the terminal face of Pedersen Glacier. Not a single one of the guides had ever seen the glacial lake so free of ice, something drastic had happened over the winter. Taking advantage of the open water we paddled as a group closer to the face of Pedersen Glacier than any of us had ever been. Pedersen Glacier has been retreating quicker than any other tidewater glacier in Aialik fjord, it's an incredibly active place, avalanches and rocks fell as we paddled, icebergs cracked and rolled, all as we were paddling in an enormous recently revealed glacial landscape. We even spied a black bear foraging high up on the mountain side. Given the short window of safety in Pedersen Lake, we turned around within two hours as to ensure we made it out of Pedersen Glacier Lagoon before the drastic tide change which creates currents greater than 6 knots. Exiting the Pedersen Lagoon mouth went smoothly and we quickly paddled the 6 miles back to basecamp at Holgate Glacier with dinner, sleep, and theories of why Pedersen Lake was so free of the icebergs we were so accustomed to seeing on our minds. Back at camp we quickly ate a couple of tasty Halibut tacos each, and hurried off to bed to rest after an truly epic 20+ mile day of sea kayaking in Kenai Fjords National Park. Over the course of a 4-day sea kayaking expedition in Aialik Fjord the Sunny Cove staff and owner practiced, trained, refined and enjoyed subjects such as birding, mammalogy, glaciology, geology, plant identification, group management, paddling technique, leadership styles, and seamanship. After departing from the Seward Harbor via the Alaska Wildland Adventures (AWA) water taxi fittingly named the Weather or Knot, the Sunny Cove guides breathed a collective sigh of relief as we knew then, we were departing civilization with only the belongings we had with us on the boat, there was no longer the need to triple check the presence of each piece of gear. 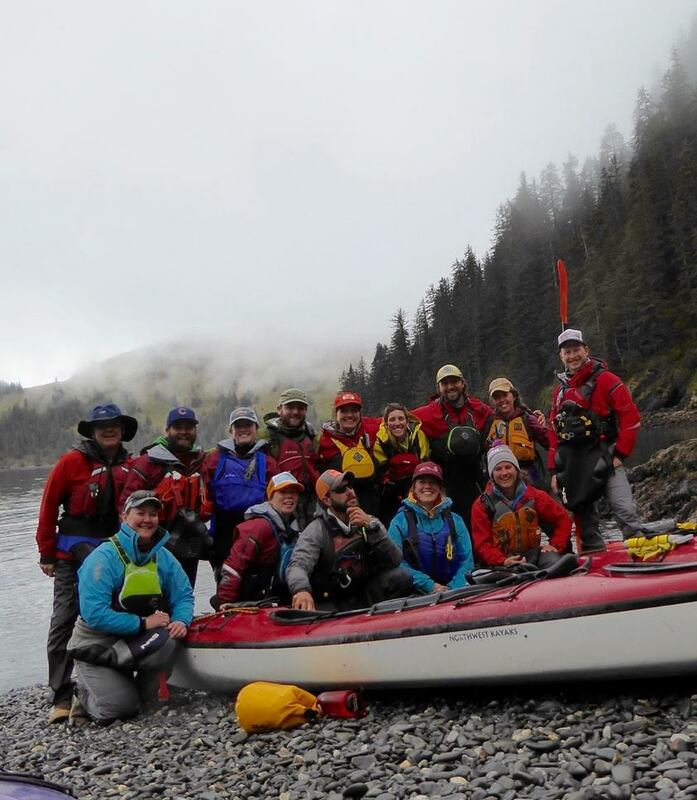 We were now headed out to the wilderness of Kenai Fjords National Park with only the modern sea kayaking equipment necessary for a 4-day paddling adventure and the communal atmosphere of the recently reunited Sunny Cove staff. Motoring across the calm waters of Resurrection Bay we viewed sea otters, seals, and sea lions. Once we reached the Harding Gateway at the mouth of Resurrection Bay we spotted our first whale spouts including an elusive gray whale migrating past the fjord on its way from Baja California Sur to feed on the rich marine abundance of the Bering Sea, the longest known migration of any mammal. The majority of guides had seen gray whales before in the lower 48, where they spend a significant portion of time near-shore, but seeing a gray whale above 60 degrees North in Alaska was a special treat. We were dropped off at McMullen Cove and we packed our kayaks with a quickly rising tide. We pushed off just as the tide was beginning to touch the bows of our kayaks and paddled through the peaceful, serene, and drizzly McMullen Cove, passed a handful of lively waterfalls on the way to our lunch destination- Quicksand Cove. Tidal Lagoon and ghost forest behind Quicksand beach. The group gathering for a mid-day lunch in a thick mist on Quicksand Beach. After a feasting on a delicious sandwich spread we launched and paddled north with our hearts set on reaching the 6-mile Holgate Arm of Aialik Fjord to view the magnificent tidewater face of Holgate Glacier. Paddling out of Quicksand Cove we spied mountain goats lazily munching new spring growth whilst precariously perched on unimaginably steep hillsides, and the sound of humpback whale spouts to our aft reminded us of our love for the ocean and all its' inhabitants. Before we reached the Holgate Arm we were pleasantly interrupted by one of the most unique wildlife gatherings many of us had ever seen. Double eagle, single black bear. As we rounded a small rocky point, we spotted from a distance the familiar white head of a bald eagle, except very unusually there were two sitting right next to each other well within their 6 foot wingspan. Having an enormous human-sized wingspan creates both a difficult landing and take-off in dense spruce foliage, especially within 6 inches of another already perched eagle. The 14 guides on the trip were already marveling at the two eagles perched so delicately next to each other when a plump black bear poked its' head out from behind the same spruce tree and paying us little attention as we paddled by. This unique wildlife combo was likely the most American thing that any of us had ever seen! After nearly fulfilling (never quite possible ;)) our fix of paddling, and wildlife viewing we made camp above the tideline on the north side of the Holgate Arm where we filled our bellies with local salmon and quinoa, then laid our heads to rest to the sound of a steady drizzle pitter pattering the outside of our tents and the Holgate Glacier rumbling with calving ice just a short paddle away, with the thought of tomorrows adventure gently seducing us to sleep.